Many of the concepts from curves, especially NURBS ones, carry directly over to NURBS surfaces, such as control points, Order, Weight, Resolution, etc. Here we will just talk about the differences. It is very important to understand the difference between NURBS curves and NURBS surfaces: the first one has one dimension, the latter has two. Blender internally treats NURBS surfaces and NURBS curves completely differently. There are several attributes that separate them but the most important is that a NURBS curve has a single interpolation axis (U) and a NURBS surface has two interpolation axes (U and V). Visually you can tell which is which by entering Edit Mode and looking at the 3D View header: either the header shows Surface or Curve as one of the menu choices. Also, you can extrude a whole NURBS surface curve to create a surface, but you cannot with a simple NURBS curve. Control points for NURBS surfaces are the same as for NURBS curves. However, their layout is quite constraining. The concept of „segment“ disappears, replaced by „rows“ and the overall „grid“. A „row“ is a set of control points forming one „line“ in one interpolation direction (a bit similar to edge loops for meshes). So you have „U rows“ and „V rows“ in a NURBS surface. The key point is that all rows of a given type (U or V) have the same number of control points. Each control point belongs to exactly one U row and one V row. This is very important to grasp: you cannot add a single control point to a NURBS surface; you have to add a whole U or V row at once (in practice, you will usually use the Extrude tool, or perhaps the Duplicate one, to add those…), containing exactly the same number of points as the others. This also means that you will only be able to „merge“ different pieces of surfaces if at least one of their rows matches together. Guess what? Yes, it works exactly like NURBS Curves! Weight specifies how much each control point „pulls“ on the curve. In Fig. One control point with a weight of 5. a single control point, labeled „C“, has had its Weight set to 5.0 while all others are at their default of 1.0. As you can see, that control point pulls the surface towards it. If all the control points have the same Weight then each effectively cancels each other out. It is the difference in the weights that cause the surface to move towards or away from a control point. The Weight of any particular control point is visible in the Transform Properties N, in the W field (and not the Weight field…). NURBS can create pure shapes such as circles, cylinders, and spheres (note that a Bézier circle is not a pure circle). 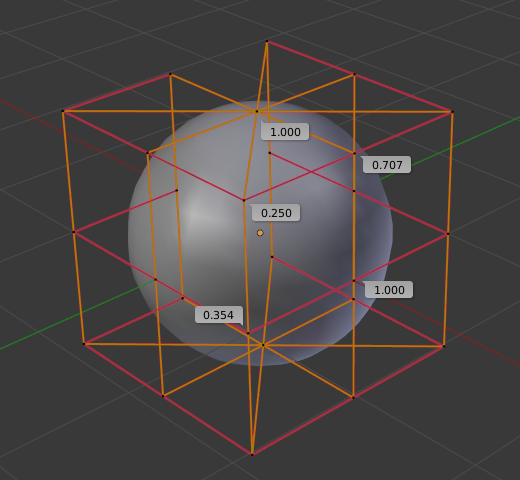 To create pure circles, globes, or cylinders, you must set to specific values the weights of the control points. Some of which are provided as presets in the Curve Tools panel (lower right corner). This is not intuitive, and you should read more on NURBS before trying this. To create a sphere with 2D surfaces, its the same principle as with a 2D circle. You will note that the four different weights needed for creating a sphere (1.0, 0.707 = sqrt(0.5), 0.354 = sqrt(2)/4, and 0.25).